Installing SATA Drivers without a Floppy Disk (Windows XP) - TACKtech Corp.
New PC doesn't have a floppy drive. Floppy drive is not functioning properly. Drivers for controller shipped on a CD. You don't want to press the F6 key during your installation. Caution: Windows Vista PE discs do NOT natively support the SiI 3112 Controller. Do not attempt using a DISKPART script from a USB drive. You may format the USB drive instead of the intended hard drive. 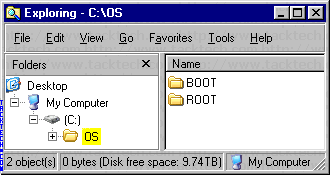 Copy the entire Windows XP SP2 CD (or extract the ISO) into folder ROOT. 1.) Download Drivers. (sata-drivers.zip ~466KB). 2.) Create the folder structure C:\OS\ROOT\$OEM$\$1\DRIVERS. 3.) Extract the file from sata-drivers.zip into the folder C:\OS\ROOT\$OEM$\$1\DRIVERS. 1.) Download Drivers. (sata-i386.zip ~668KB). 2.) Extract the file from sata-i386.zip into the folder C:\OS\ROOT\i386. For more information on unattended scripts see Article TTID# 202. I won't make you suffer through listening to me ramble on about SIF files. Simply create a new text file named WINNT.SIF in i386 folder. [Data] AutoPartition=0 MsDosInitiated="0" UnattendedInstall="Yes" [Unattended] UnattendMode=FullUnattended UnattendSwitch=Yes OemSkipEula=Yes OemPreinstall=Yes ConfirmHardware=No OemSkipEula=Yes TargetPath=\WINDOWS Repartition=No WaitForReboot="No" DriverSigningPolicy=Ignore OemPnPDriversPath="DRIVERS\SATA\IASTOR;DRIVERS\SATA\PROMISE\i386\ulsata2.inf;DRIVERS\SATA\PROMISE\i386;DRIVERS\SATA\SILICON\3112" [GuiUnattended] OEMSkipWelcome = 1 [UserData] ProductKey=xxxxx-xxxxx-xxxxx-xxxxx-xxxxx ComputerName=WorkStation FullName="" OrgName=""
Enter the ProductKey in place of xxxxx-xxxxx-xxxxx-xxxxx-xxxxx. Enter the ComputerName in place of WorkStation. Enter the FullName in quotes. Enter the OrgName in quotes. Open TXTSETUP.SIF using your favorite text editor. PCI\VEN_105A = "ulsata2" PCI\VEN_8086&DEV_2922&CC_0106 = "iastor" PCI\VEN_8086&DEV_282A&CC_0104 = "iastor" PCI\VEN_8086&DEV_2829&CC_0106 = "iastor" PCI\VEN_8086&DEV_2822&CC_0104 = "iastor" PCI\VEN_8086&DEV_2821&CC_0106 = "iastor" PCI\VEN_8086&DEV_2682&CC_0104 = "iastor" PCI\VEN_8086&DEV_2681&CC_0106 = "iastor" PCI\VEN_8086&DEV_27C3&CC_0104 = "iastor" PCI\VEN_8086&DEV_27C6&CC_0104 = "iastor" PCI\VEN_8086&DEV_27C1&CC_0106 = "iastor" PCI\VEN_8086&DEV_27C5&CC_0106 = "iastor" PCI\VEN_8086&DEV_2653&CC_0106 = "iastor" PCI\VEN_1095&DEV_3112&SUBSYS_61121095 = "si3112r" PCI\VEN_1095&DEV_3112&SUBSYS_611215D9 = "si3112r" PCI\VEN_1095&DEV_3112&SUBSYS_34228086 = "si3112r" PCI\VEN_1095&DEV_3112&SUBSYS_B0031458 = "si3112r" PCI\VEN_1095&DEV_3112&SUBSYS_A0111019 = "si3112r" PCI\VEN_1095&DEV_3112&SUBSYS_A0121019 = "si3112r" PCI\VEN_1095&DEV_3112&SUBSYS_A0131019 = "si3112r" PCI\VEN_1095&DEV_3112&SUBSYS_A0141019 = "si3112r" PCI\VEN_1095&DEV_3112&SUBSYS_A0151019 = "si3112r" PCI\VEN_1095&DEV_3112&SUBSYS_1014147B = "si3112r" PCI\VEN_1095&DEV_3112&SUBSYS_100B147B = "si3112r" PCI\VEN_1095&DEV_3112&SUBSYS_1402147B = "si3112r" PCI\VEN_1095&DEV_3112&SUBSYS_1404147B = "si3112r" PCI\VEN_1095&DEV_3112&SUBSYS_1802147B = "si3112r" PCI\VEN_1095&DEV_3112&SUBSYS_1804147B = "si3112r" PCI\VEN_1095&DEV_3112&SUBSYS_1C00147B = "si3112r" PCI\VEN_1095&DEV_3112&SUBSYS_5930107D = "si3112r" PCI\VEN_1095&DEV_3112&SUBSYS_249510F1 = "si3112r" PCI\VEN_1095&DEV_3112&SUBSYS_809D1043 = "si3112r" PCI\VEN_1095&DEV_3112&SUBSYS_0270A0A0 = "si3112r" PCI\VEN_1095&DEV_3112&SUBSYS_044DA0A0 = "si3112r" PCI\VEN_1095&DEV_3112&SUBSYS_044CA0A0 = "si3112r" PCI\VEN_1095&DEV_3112&SUBSYS_92011905 = "si3112r" PCI\VEN_1095&DEV_3112&SUBSYS_92151905 = "si3112r" PCI\VEN_1095&DEV_3112&SUBSYS_904C1905 = "si3112r" PCI\VEN_1095&DEV_3112&SUBSYS_904B1905 = "si3112r" PCI\VEN_1095&DEV_3112&SUBSYS_A41810FD = "si3112r" PCI\VEN_1095&DEV_3112&SUBSYS_A41910FD = "si3112r" PCI\VEN_1095&DEV_3112&SUBSYS_A71910FD = "si3112r" PCI\VEN_1095&DEV_3112&SUBSYS_90171695 = "si3112r" PCI\VEN_1095&DEV_3112&SUBSYS_C2001297 = "si3112r" PCI\VEN_1095&DEV_3112&SUBSYS_C2011297 = "si3112r" PCI\VEN_1095&DEV_3112&SUBSYS_15D40035 = "si3112r" PCI\VEN_1095&DEV_3112&SUBSYS_340217F2 = "si3112r" PCI\VEN_1095&DEV_3112&SUBSYS_100415BD = "si3112r" PCI\VEN_1095&DEV_3112&SUBSYS_F641270F = "si3112r" PCI\VEN_1095&DEV_3112&SUBSYS_0C0F105B = "si3112r" PCI\VEN_1095&DEV_3112&SUBSYS_0C13105B = "si3112r" PCI\VEN_1095&DEV_3112&SUBSYS_0C58105B = "si3112r" PCI\VEN_1095&DEV_3112&SUBSYS_0C40105B = "si3112r" PCI\VEN_1095&DEV_3112&SUBSYS_0C41105B = "si3112r" PCI\VEN_1095&DEV_3112&SUBSYS_0C42105B = "si3112r" PCI\VEN_1095&DEV_3112&SUBSYS_0C43105B = "si3112r" PCI\VEN_1095&DEV_3112&SUBSYS_0C44105B = "si3112r" PCI\VEN_1095&DEV_3112&SUBSYS_0C22105B = "si3112r" PCI\VEN_1095&DEV_3112&SUBSYS_0C2A105B = "si3112r" PCI\VEN_1095&DEV_3112&SUBSYS_2A1E103C = "si3112r" PCI\VEN_1095&DEV_3512&SUBSYS_65121095 = "si3112r" PCI\VEN_1095&DEV_3512&SUBSYS_B0031458 = "si3112r" PCI\VEN_1095&DEV_3512&SUBSYS_1014147B = "si3112r" PCI\VEN_1095&DEV_3512&SUBSYS_1021147B = "si3112r" PCI\VEN_1095&DEV_3512&SUBSYS_100B147B = "si3112r" PCI\VEN_1095&DEV_3512&SUBSYS_1C06147B = "si3112r" PCI\VEN_1095&DEV_3512&SUBSYS_1C00147B = "si3112r" PCI\VEN_1095&DEV_3512&SUBSYS_1C03147B = "si3112r" PCI\VEN_1095&DEV_3512&SUBSYS_1C04147B = "si3112r" PCI\VEN_1095&DEV_3512&SUBSYS_1406147B = "si3112r" PCI\VEN_1095&DEV_3512&SUBSYS_1407147B = "si3112r" PCI\VEN_1095&DEV_3512&SUBSYS_90191695 = "si3112r" PCI\VEN_1095&DEV_3512&SUBSYS_C2021297 = "si3112r" PCI\VEN_1095&DEV_3512&SUBSYS_C2031297 = "si3112r" PCI\VEN_1095&DEV_3512&SUBSYS_C2041297 = "si3112r" PCI\VEN_1095&DEV_3512&SUBSYS_534D108E = "si3112r" PCI\VEN_1095&DEV_3512&SUBSYS_02B71014 = "si3112r" PCI\VEN_1095&DEV_3512&SUBSYS_02C51095 = "si3112r" PCI\VEN_1095&DEV_3512&SUBSYS_2A1E103C = "si3112r" PCI\VEN_1002&DEV_436E&SUBSYS_436E1002 = "si3112r" PCI\VEN_1002&DEV_436E&SUBSYS_0A44174B = "si3112r" PCI\VEN_1002&DEV_436E&SUBSYS_0A45174B = "si3112r" PCI\VEN_1002&DEV_436E&SUBSYS_00301462 = "si3112r" PCI\VEN_1002&DEV_4379&SUBSYS_43791002 = "si3112r" PCI\VEN_1002&DEV_437A&SUBSYS_437A1002 = "si3112r"
ulsata2 = "Windows Promise SATAII150/SATA300 TX Series (tm) Controller" iastor = "Intel(R) SATA RAID/AHCI Controller" si3112r = "Silicon Image SiI 3112 SATA RAID Controller"
Open DOSNET.INF using your favorite text editor. Select one of the following options to continue.